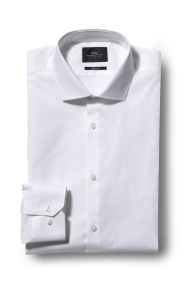 Get straight to the point with this simple but premium white shirt from Moss London. Tailored to provide an extra slim fit, this versatile shirt is a must-have for any stylish dresser. Single cuffs mean no fuss, while 3% elastane in the fabric guarantees just the right amount of stretch and all-day comfort. Mix and match to your heart's content. Go casual with an open neck, smarten up with a dark skinny tie, or be creative and select something bright and bold that'll turn heads. Was struggling to find a good fitting white shirt for my husband who lifts weights this shirt fits well and has stretch it is an extra slim fit and fits well without looking too tight. Looks great and fits well. If I had ever received the item I would be able to tell you. Better than expected. I recommend. Good buy but sleeves were slightly long for my son. Great value and stylish shirt. Perfect product, the shirt felt and looked like it was tailor-made for me, a perfect fit for my body. Bought for my 16 yr old son who is tall and skinny and very fussy over the fit! Light fabric great to wash and hardly needed ironing. Fitted style on the body and the length of the arms were perfect as usually the arms are too long or too baggy this shirt was perfect. Nice shirt. Nothing special, and it's supposedly an 'extra slim fit' but it's quite baggy on the arms and around the belly, whereas it's tight around the chest, neck and waist. Although, this might be due to the fact I tend to fit into muscle fit shirts better. Fits well with the suit !! Nice suit. Waistcoat available too. Extra shirt is always handy. Shoes are nice and a good price. Only one button hole on the cuff, but we're sorting that ourselves, so not actually 'free'. Got this item for a job interview and fitted well no issues. Good slim fit for 17 y/o. Excellent quality, price and quality. Good quality, nice fit, looks smart. Lovely fitted shirt and went well under suit..
Amazing quality, fit and price. Smart and good fit. Very pleased with suit shirt and tie. Beautiful fit and material - will be buying more over the next few weeks to fill out my work wardrobe. Love the stretch material but unfortunately too short in shirt length. Great fit, extremely comfortable. 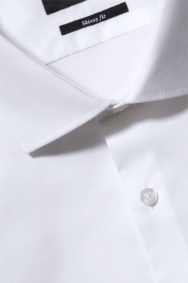 Perfect plain white shirt to go under any suit or jumper. Fits very well and looks good. Very comfortable shirt, the elastine in the material makes it hug the body nicely without feeling tight.